Givenchy Live Irresistible is a beautiful fresh floral and fruity fragrance that combines gourmand scents of pineapple, the delicacy of soft rose petals, and the unique boldness of allspice berries and the sensual warmth of amber and musks. 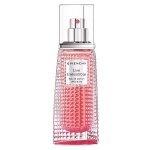 Givenchy Live Irresistible is a unique cocktail of flowers, fruits, and spices for a fragrance that gives life a scent of whimsy—a surprising Eau de Parfum with a feisty character. If you like this perfume, have you tried Prada Candy or Guerlain La Petit Robe Noire EDP or perhaps Paco Rabanne Olympea?